Monsignor Gerard Burns blessed the new facility. It was a great day in Upper Hutt City, as over 50 guests attended the opening of the new St John of God Clouston Park Community Home. 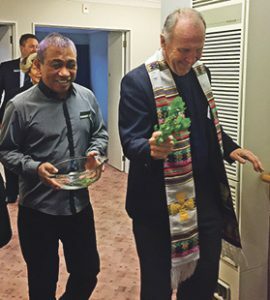 Monsignor Gerard Burns blessed the facility and people from all around the local community, including prospective residents and their families, spent time wandering through the 12-room home. The new home will provide residential care for people with neurological and physical disabilities. 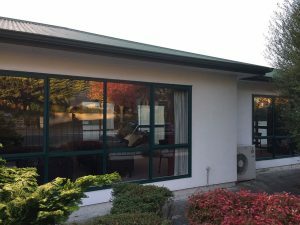 Plans for the home started last December, when the former rest home – previously known as ‘Oma’s Place’ – was advertised for rent. The owners had purchased the home several years ago, with a vision to work with their church to provide a home for people with disabilities. 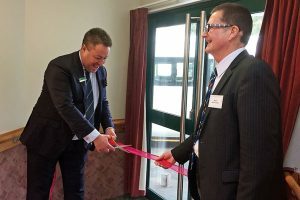 Although their original plans failed to eventuate, they were excited to partner with St John of God Hauora Trust and see the vision fulfilled, meeting growing needs for care and respite in the region. David is excited to be one of the first to move in. Board Chair, Bevan Killick, who cut the ribbon at the opening, commented it was wonderful to see the influence that one person (St John of God) continued to have from half-way around the world and some 500 years after he began his ministry. St John of God Hauora Trust aims to continue the healing mission of Jesus Christ through the provision of health and social services – promoting life to the full by enhancing the physical, emotional, social and spiritual dimensions of being human. 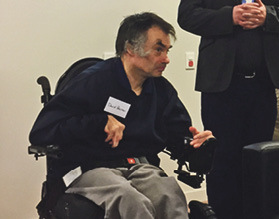 Nigel Matthews works with the St John of God Hauora Trust. Board Chair, Bevan Killick, with local Mayor and Deputy Chairperson of the local District Health Board, Wayne Guppy. New St John of God Clouston Park Community Home.